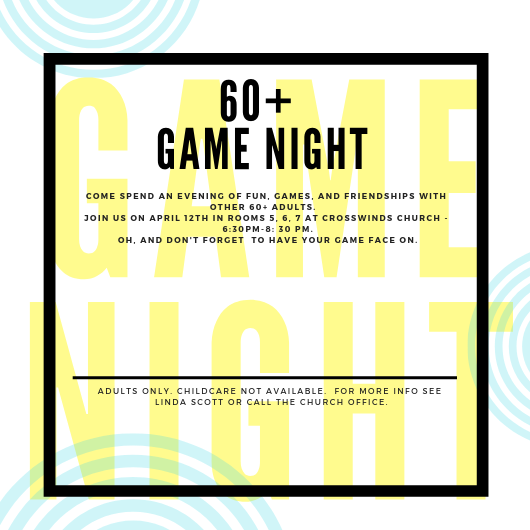 COME SPEND AN EVENING OF FUN, GAMES, AND FRIENDSHIPS WITH OTHER 60+ ADULTS. JOIN US ON APRIL 12TH IN ROOMS 5, 6, 7 AT CROSSWINDS CHURCH – 6:30PM-8: 30 PM. OH, AND DON’T FORGET TO HAVE YOUR GAME FACE ON. ADULTS ONLY. CHILDCARE NOT AVAILABLE. FOR MORE INFO SEE LINDA SCOTT OR CALL THE CHURCH OFFICE.